A bird flu pandemic would lead to "enormous global costs" for the world economy, a new World Bank report says. In a study of East Asian economic performance, the World Bank identified bird flu as a "large shadow" already affecting growth in some areas. Tourism, transport and retail sectors would all suffer if a pandemic broke out, while East Asia's poultry industry is already struggling, the bank said. The warning came as regional leaders met for talks dominated by bird flu. The World Bank predicted that East Asian economic growth would slow during 2006, but would suffer much more if a pandemic erupted. "One large shadow looms over the generally positive economic outlook we have sketched out... and that is avian flu," said World Bank economist Homi Kharas. In a separate analysis, the Asian Development Bank warned that the economic damage from a pandemic could be as high as $282bn (£158bn), assuming 20% of the region's population falls ill. 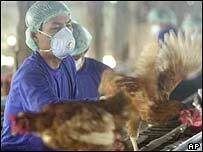 The deadly H5N1 strain of bird flu has killed more than 60 people in South East Asia since late 2003. The foreign ministers of Cambodia, Laos, Burma, Thailand and Vietnam have agreed to co-operate closely to control the spread of the disease and develop a human vaccine. Poultry stocks in Vietnam and Thailand have already fallen by 15% to 20% as a result of the disease and control measures such as culling. Further talks are expected in the prime ministers' meeting in Bangkok on Thursday. The World Bank urged the international community to avert a possible catastrophe. "There are great uncertainties about the timing, virulence and general scope of a future human flu pandemic," the report said. "But all agree it could lead to at least several million human deaths." Individual efforts to avoid infection, as well as official quarantines and travel restrictions, would have an immediate impact on the economy, the report added. The short term effect of the pneumonia-like disease SARS in 2003 was, the report says, equivalent to about 2% of incomes in East Asia. SARS killed about 800 people. Without a bird flu pandemic, the report is more positive, noting that economies in East Asia have adjusted well to some fairly serious shocks, notably the doubling of oil prices. Economic growth across the region is forecast to slow to 6.2% this year from 7.2% in 2004 but remain at the same level in 2006. A combination of rising oil prices, a slowdown in the high-tech sector and a dip in Chinese consumer demand has subdued exports. China's efforts to cool its unbridled economic expansion could prove partially successful, the World Bank said. Its annual growth is expected to slow to 8.7% in 2006 from 9.3% this year, signalling a "very soft landing" for its economy.